offering complete landscaping and hardscaping services, both residential and commercial. 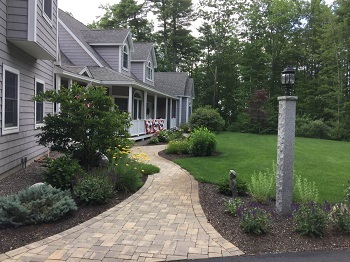 Our customers say we are one of the most dependable companies that service all of the Lakes Region of New Hampshire. Your home speaks volumes about who you are. You put a lot into it. You decorate it to your own personal taste. Your Landscaping is like the ‘cover on your book’. It is the first thing that’s seen when you drive up your driveway. Don’t let your landscaping detract from your home. Let it set the tone and welcome your guests. Good landscaping will reflect the style in your home and embrace it with beauty. Is your home a lakeshore property? Perhaps a nature-inspired, vacation retreat is the feel you want. If your home is a turn-of-the-century farmhouse, then creating old fashioned styled gardens would complement it well. Whatever your needs are, we can help. When you consider landscaping your property, it’s a good idea to make a list of all of your ideas and concerns. We can work with you to show you some great possibilities. We will work to combine all of your ideas into a comprehensive idea that can fit into your budget. Your landscaping project can be broken into logical segments. Do it over time or all at once. The choice is yours. In the end, you will love your new landscaping! Do you like manicured shrubbery or loose, natural looks? Do you need low maintenance plants? Are there any views to hide or accentuate? Are there strong winds that need to be blocked? How many people you want to entertain on your patio? How much furniture and accessories will you need? Any features such as fire pits, a built-in grill island, etc? Any permit requirements or tricky grades to take into account? What kind of a ‘feel’ should it have? Do you prefer irregularly shaped bluestone, or brick type pavers? If you take the time to consider these questions, you can insure that your patio will come out just as you’ve dreamed of! Landscapes by Tom uses state-of-the-art computer aided landscape design software. Our professional design software gives you the most accurate and comprehensive information available on your proposed landscaping. 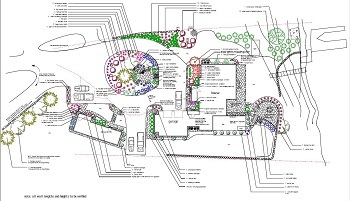 You will receive a detailed plan which incorporates and clearly labels all of your landscaping, from plants to retaining walls, to patios, and everything in between. This software also has the capability to produce gorgeous computerized renditions (photo realistic images) of your finished landscape. By seeing a computerized photo image of your complete landscaping, you can easily visualize what your proposed project will look like before starting the installation process.